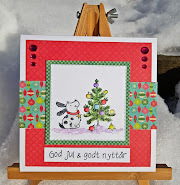 Hos Dorte: Reminder for 'Hot Summerdays' a DT card for HMFMC! Reminder for 'Hot Summerdays' a DT card for HMFMC! 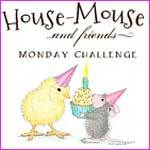 House Mouse & Friends . and cut out with a stitched rectangular die. the sentiment is also from LOTV. A big thank you to our fabulous sponsors! Ganz toll gemacht. Danke für deine Teilnahme bei den Sketch-Tanten. Very pretty card. 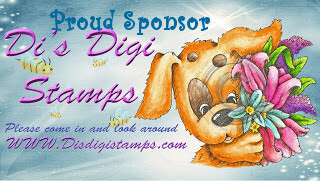 Love the details and digi/stamp. Thanks for your entry in our challenge at Tuesday Throwdown. Happy Crafting! Perfect summertime card! Adorable image! I'm so glad you joined our weekly challenge at QKR Stampede! Hello…. You have made a beautiful card…. That little mouse is so cute eating a piece of melon... Thanks for entering it into the ‘Food/Drink’ challenge at Crafty Friends Challenge Blog. Good luck in the draw and hope you can join us again for our next challenge. 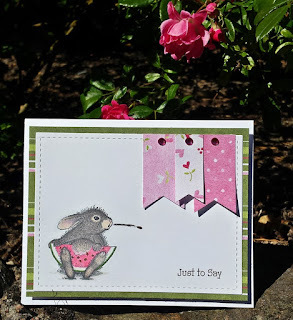 Hi Dorte love this sweet hopper image gorgeous CAS card ..
A lovely design. Thank you for joining in the QKR Stampede challenge. Your little hopper is enjoying his watermellon. Sweet card, and love the flags too. What a beautiful design. Thank you for joining us. Good luck and hope to see you in the next challenge with us !! I adore this image! Cute Dorte! Thank you for joining us at the Sketch-Tanten. Christmas in July, a DT card for HM&F! Hot Summer Days, a DT card for HMFMC.